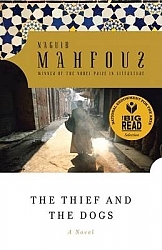 Naguib Mahfouz's haunting novella of post-revolutionary Egypt combines a vivid pychological portrait of an anguished man with the suspense and rapid pace of a detective story. After four years in prison, the skilled young thief Said Mahran emerges bent on revenge. He finds a world that has changed in more ways than one. Egypt has undergone a revolution and, on a more personal level, his beloved wife and his trusted henchman, who conspired to betray him to the police, are now married to each other and are keeping his six-year-old daughter from him. But in the most bitter betrayal, his mentor, Rauf Ilwan, once a firebrand revolutionary who convinced Said that stealing from the rich in a unjust society is an act of justice, is now himself a rich man, a respected newspaper editor who wants nothing to do with the disgraced Said. As Said's wild attempts to achieve his idea of justice badly misfire, he becomes a hunted man so driven by hatred that he can only recognize too late his last chance at redemption.